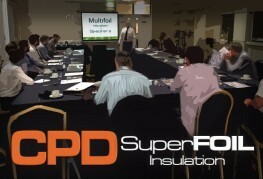 SuperFOIL will be presenting a 1 hour CPD event on "Multifoil Insulation for Specifiers" hosted by Approved Inspectors Ltd in Shropshire. This 1 hour presentation covers the use of multifoil insulation and the benefits of specifying it in roof, wall and floor applications. We touch on how Multifoil insulation is installed, certification and how it complies with building control and the thermal properties of insulation in general. The course is a thorough introduction to SuperFOIL and multifoil insulation in general. This course is designed to fully inform specifiers on the SuperFOIL product range and the key benefits in choosing this effective multi-foil insulation. This course explores how heat is lost from a property: the thermal benefits of SuperFOIL and runs through an overview of installation on wall; roof and floor applications. The course is Certified with the CPD Certification Service and counts as 1 hour towards your annual CPD requirement.